There is a total misunderstanding of the role of gold and why it is so critical to own physical gold. Gold should not be bought or sold based on rumours or events. In connection with the US election, gold moved for totally the wrong reasons. The whole Western world had forecast a Clinton victory. The Western media, which does no analysis but only reports what they are fed, spent no time trying to understand what the mood of the people was. It was exactly the same with Brexit. The elite in London, New York and the big metropolitan areas has totally different objectives to ordinary people. The trend change in public reaction, which we are seeing now, is not just a temporary phenomenon. Ordinary people are tired of a small elite of bankers, industrialists and politicians helping themselves to unlimited power and wealth whilst normal people are just getting poorer with lower incomes and more debt. And it is the masses which ultimately are responsible for repaying debt which is increasing exponentially in most countries. They will of course not repay the debt because they can’t. Instead, they will suffer immeasurably when global debt of around $250 trillion implodes leading to a severe depression. The gap between the rich and the poor in the West is wider than ever. In the US, the top 0.1% have 22% of total wealth. US top professionals have had an increase in real pay of 51% since 1973 whilst normal workers have seen a reduction of 4.6%. This is a very dangerous trend and when the economic downturn comes, it is likely to lead to violent protests and social unrest. Coming back to gold, we saw the most incredible volatility during last week. As the Trump victory became clear, gold went from $1,270 to $1,335 in under 4 hours’ overnight trading. Then massive selling of gold futures pushed the price down to $1,270 where it started before election. On Friday last week it was pushed down further to $1,225 which is $110 from the euphoric election peak. Initially, heavy paper speculative buying of gold took place around the world but very little serious physical buying. Some gold experts predicted that gold would go up by at least $100 if Trump won. Well, it did go up $65 but then declined over $100 from there. A dealer in London ran out of physical stock due to panic retail buying. But when the stock markets turned around from down 4-5% to up, the paper longs in gold were liquidated and speculative funds flowed into stock markets instead. Two years of gold production was traded after the election – all in the paper market. As usual when gold is dumped in the futures market there is little selling of physical. Thus, the paper price of gold is totally false and in no way reflects what is happening in the physical market. It is likely that commercial gold buyers, who are already long, will add to positions at these suppressed levels. The paper market has 100-300 oz of paper gold for every 1 oz of physical gold. When the commercials add to positions at these artificially low levels, there is likely to be a major short squeeze. Gold investors should totally ignore these short term moves as well as any news or events that temporarily move gold. Sadly, many investors buy gold when it goes up and sell it when it goes down. This behaviour shows a total ignorance of the role of gold and why it is so important to hold physical gold. Because gold is not an investment and should definitely not be seen as a speculative commodity. But futures traders and the bullion banks have no interest in gold for wealth protection purposes. For them it is just a commodity traded in the paper market with no intention of ever taking delivery. When gold moves strongly based on events, the move is seldom sustained. Those moves are mostly speculative and in the paper market. Sustained moves in gold are due to the debasement of paper money and nothing else. Since the creation of the Fed in 1913, all major currencies have declined 97-99% against gold. The US has not had a real budget surplus since 1960 so the trend is very clear and unlikely to be reversed any time soon. Since 1971 when Nixon abolished the gold backing of the dollar US debt has grown by an average of 9% per year. 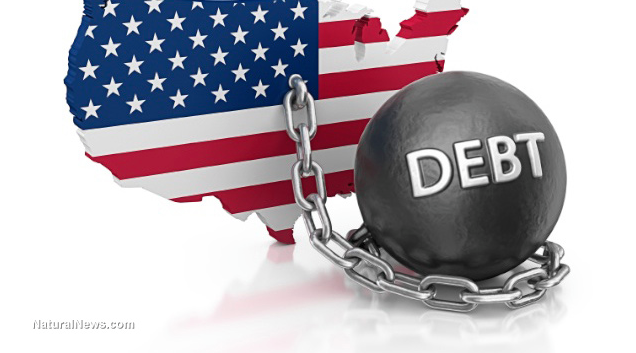 This means that US federal debt has doubled every eight years. And Obama is no exception. He duly complied with the trend of exponential debt increases and doubled US debt from $10 trillion to $20 trillion. It took the US 232 years to go from zero debt to $10 trillion and Obama managed to double it in just 8 short years. What an achievement! Long term US interest rates turned up earlier this year with 10 year Treasury yield up 63% from 1.4% to 2.28%. 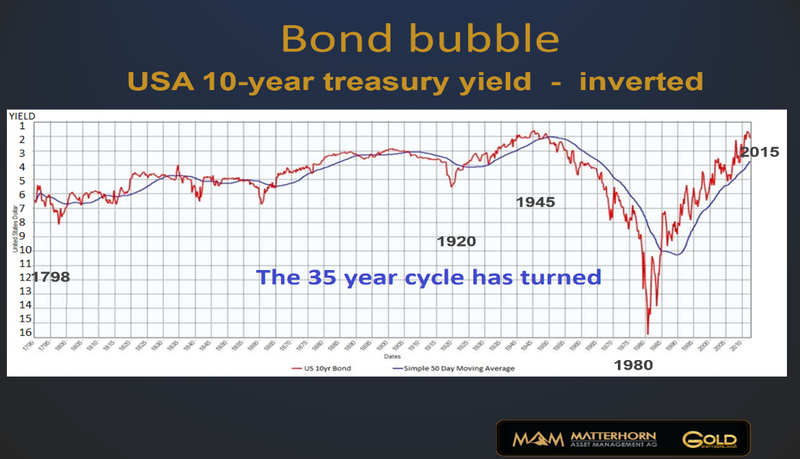 The 35 year rate cycle has now turned and rates are likely to go back to at least the 16% we saw in 1980 but probably a lot higher as the biggest bond bubble in history bursts. Due to the massive size of this bubble on a global scale, the increase in rates could happen very quickly. This will not just affect debt markets and the ability of governments to pay the interest but also the derivatives market. The $1.5 quadrillion of global derivatives are extremely sensitive to interest rate increases and that market will not survive much higher interest rates. And if we look around the world, the risks are unprecedented. Japan is totally bankrupt; China has a major debt problem and the European banking system is unlikely to survive in its present form. Also, what started with Brexit is likely to continue in many European countries. Just like in the US, many Europeans are tired of an elite in Brussels ruling over 500 million people with little understanding of the resentment that this unaccountable and unelected elite is causing. The Italian election is next in December and then we have France and Germany in 2017. The breakup of the EU and the end of the Euro is just a matter of time and it could happen a lot faster than anyone expects. 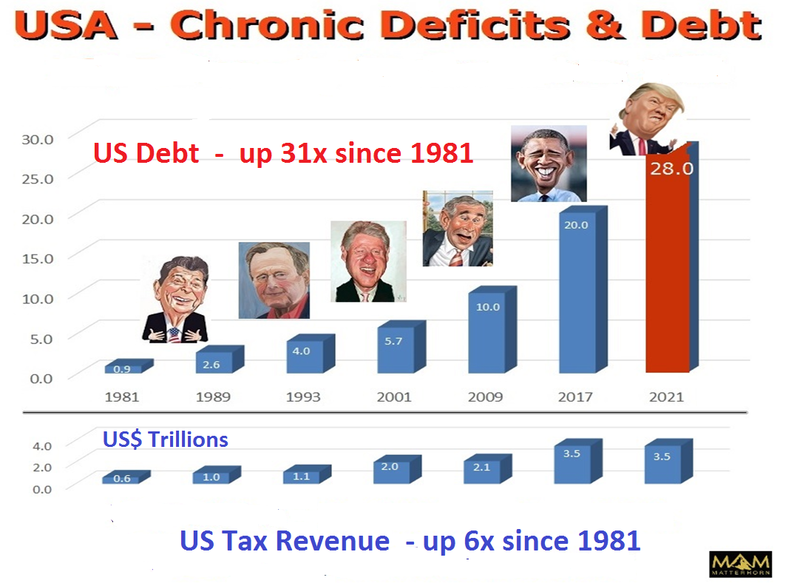 With all these problems around the world, Trump will have major difficulties reversing the trend of debts, deficits and no real growth of the US economy. Global trade is already declining and is likely to deteriorate substantially in the next few years. With both global and US problems of unparalleled proportions, it is not the best time to become president of the biggest and most indebted economy in the world. Clearly, Trump is determined to succeed but running an insolvent economy in a virtually bankrupt world will be a lot harder than building a property empire. But he has made it clear that he is hell-bent on expanding the US economy at all costs. The problem is that he will probably spend more money than anyone can imagine. But sadly, he will be pushing on a string since borrowing and printing money can never repair an economy which is fatally broken. As the world enters a period with risk exponentially greater than in 2006, the reasons for holding physical gold as insurance and wealth protection are more compelling than ever. The continued debasement of the currencies will guarantee a higher gold price. During Obama’s eight years, gold went up by 36% only whilst debt doubled and Trump is likely to grow debt exponentially. In addition, the failure of the paper gold market could happen at any time. When this happens there will be no physical gold available at any price until there is equilibrium in the physical market. At what price that will take place is impossible to forecast but it is certain to be multiples of the current price. Tagged currency debasement, paper gold, Trump and Gold.